We hear about the massacre of 32 Syrian children during the latest clashes between the Assad troops and the rebels. And just a few days ago the Chávez regime shipped diesel to that Assad regime badly needed to move their tanks. The Western had applied sanctions to Syria and Chávez helps his pal to circumvent such sanctions. The Chávez military regime has already sent three diesel shipments to the Syrian forces. A fourth one is planned. Picture taken in Venezuela in 2006. 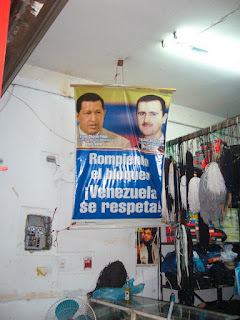 Chávez next to Assad. "Breaking the Blockage. Venezuela is to be respected!" Will Brazil say nothing? Colombia? No, because they have a wonderful trade surplus with the Chávez regime. And on the other side, we have this: US troops killed yet again another peaceful family...collateral damage, like many thousand of other cases in the last few years. Wovon lebt ein Lehrer in Venezuela? Chávez without cancer, beginning of new stories?